The Soviet Union and Japan, two expansionist powers that occupied por­tions of the Asian main­land north of China, butted heads in the Mon­go­lian bor­der­lands as early as 1929. (They had also fought a war in 1904–1905, the Russo-Japan­ese war, over influ­ence in China, Mon­go­lia, and Man­churia, the latter coun­try rich in coal, iron, and grains and with warm water ports in the northeastern-most part of China.) 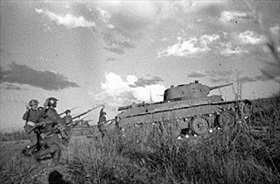 On this date in 1939, days before the Ger­man inva­sion of Poland, the two nations began a mas­sive ten-day tank battle near the Mon­go­lian Khalkha River (also known as Khalkhyn Gol)—the largest tank battle the world had yet seen and arguably the first deci­sive battle of the Second World War. Soviet forces were com­manded by a then unknown Georgy Zhukov, who, now newly pro­moted to general, would become in a few short years a mili­tary legend for spear­heading the Soviet assault on Nazi Ger­many and for­mally accepting Ger­many’s uncon­di­tional sur­render in the spring of 1945. (Ironi­cally, Zhukov was one of two Soviet generals who coor­di­nated the Soviet armies at the Battle of Kursk, the largest tank battle in his­tory, in July 1943.) The defeat of Japa­nese forces in the Battle of Khal­khyn Gol (known in Japan as the “No­mon­han Inci­dent”) had the most pro­found impli­ca­tions on the con­duct of World War II. Since 1937 Japan had been en­gaged in a pro­tracted, knock­down drag-out fight in China, which lay to the south of Japan’s pup­pet state of Man­chu­kuo (Man­churia). The stun­ning Soviet vic­tory, followed by a cease­fire on Septem­ber 15, 1939, and then an agree­ment between the two bel­li­ger­ents to respect the borders of Mon­go­lia and Man­chu­kuo, per­suaded expan­sionist circles in Tokyo (par­tic­u­larly the Imperial Japa­nese Navy) to look to South­east Asia, where they saw the United States, Brit­ain, and France—all of which had resource-rich but ill-defended pos­ses­sions there—as weaker oppo­nents than the Soviets on the Asian main­land. The stra­tegic change in course for Japan, which the Battle of Khal­khyn Gol prompted, even­tually led to a change in Japan’s expan­sionist for­tunes, beginning with the attack on the Philip­pines, the Dutch East Indies (Indo­nesia), Brit­ish Malaya (Malay­sia), and the Amer­i­can pos­ses­sion of Hawaii on Decem­ber 7 and 8, 1941. The stra­te­gic change in course also foreshadowed Japan’s downfall. Left: The four-month conflict was named after the River of Khalkh (Khal­khyn Gol), which flows through the battle­field. 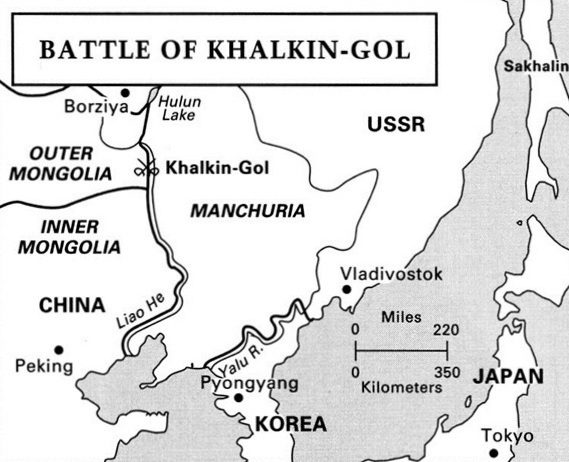 In Japan the conflict is known as the “Nomon­han Inci­dent,” named after a near­by vil­lage on the bor­der between Mon­go­lia (some­times infor­mally called Outer Mon­go­lia) and Japa­nese-occupied Manchuria (Manchukuo). 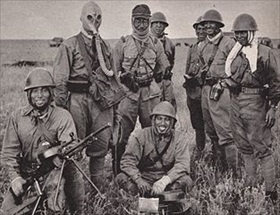 Right: Japanese soldiers pose with captured Soviet equip­ment during one of the Battles of Khal­khyn Gol. After the occu­pa­tion of Korea (1905) and Man­chu­ria (1931), Japan’s mili­tary leaders in China, essen­tially army leaders, focused expan­sionist aims on Soviet Mon­go­lia and Siberia, and con­flicts occurred fre­quently on the Man­chu­rian bor­der from mid-1929 on­ward. The army’s aggres­sive plans on the Asian main­land some­times caught the civil­ian govern­ment in Tokyo by sur­prise, as the 1931 “Muk­den Inci­dent” (also known as the “Man­chu­rian Incident”) in northern China showed. 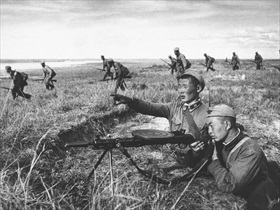 Left: Mongolian People’s Army soldiers fight against Japa­nese sol­diers, Khal­khyn Gol, 1939. The Mon­go­lian Peo­ple’s Repub­lic was pro­claimed in Novem­ber 1924 after Soviet troops expelled White Russian and Chinese forces from Mon­go­lia. Mon­go­lia then became a de facto pup­pet state of the Soviet Union. 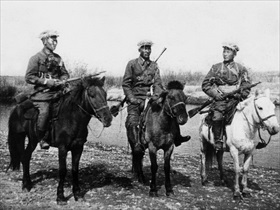 Right: Mongolian cavalry during the Battle of Khal­khyn Gol, 1939. After Soviet and Mon­go­lian armed forces had defeated Japa­nese forces in the sum­mer of 1939, the warring parties entered into a truce, set up a com­mis­sion to define the Mon­go­lian-Man­chu­rian border later in the year, and entered into a neutrality pact. 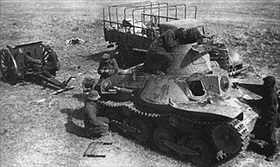 Left: A Japanese light tank (Type 95 Ha-Go) captured by Soviet troops after the Battle of Khal­khyn Gol. Six years later, on August 9, 1945, Soviet forces in­vaded Man­chu­ria (Man­chu­kuo). The rapid defeat of Japan’s Kwan­tung Army, as its army on the Chin­ese main­land was called, was a signif­i­cant factor in Japan’s sur­render. Japa­nese leaders imag­ined the Red Army in Man­chu­ria as poised to in­vade the Home Islands with boots on the ground, while the Amer­i­cans were viewed as per­fectly con­tent to con­tinue incinerating Japan from above. 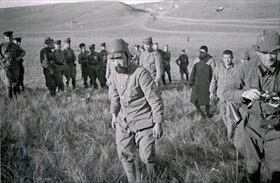 Right: Captured Japanese soldiers, Khal­khyn Gol, August 1939. Khal­khyn Gol resulted in total defeat for the Japa­nese Sixth Army, a gar­ri­son force based in Man­chu­kuo under the over­all command of the Kwantung (Japanese) Army.